My name is Emmanuel Daniels, a chartered accountant with working experience that cuts across banking, investment banking, oil & gas, manufacturing and trading. I have also been a part-time lecturer for ICAN tutorials since 2002 in a Tuition Centre In Festac Town. Also, I have been the sole lecturer for Cost Accounting for about 9 years now at the same tutorial centre. As a corollary to the above and with the objective of facilitating learning for the preparation for ICAN exam, at the Foundation Level, I have created a Complete video training course on Strategic Financial Management- That covers the contents of the current syllabus. This is the only Nigerian Video Course that prepares you for SFM exam and you can watch on any mobile device that can play MP4. 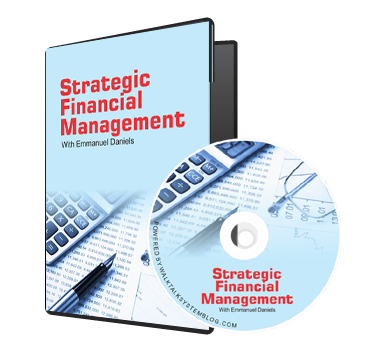 The whole contents of Strategic Financial Management is broad and sufficient time is required for complete coverage. I am not a fan of “Area Of Concentration”, so I encourage thorough study of the subject matter so that the professional can apply the same in practice – Time is required for complete coverage of the syllabus. You retain large amount of what you hear constantly (only videos can give you this this leverage) than what you read. The text books equally good but very bulky. If you lack sufficient time to attend lecture or you are re-sitting this paper, this is the best option for you. Many questions and are treated on each topic, than what you could treat in the class. The Nigerian Financial Environment And Roles Of The Financial Manager:- This section contains 5 videos that covers the Nigerian Financial environment and the financial manager, Capital Markets and Capital Market Institutions, Money Laundry, Treasury Management and International Financial Markets and institutions. Capital Budgeting:- This section contains 8 videos on capital budgeting that covers: Introduction To capital Budgeting and key concepts, Investment Appraisal methods with illustrations, Further problems and solutions On Investment Appraisal, Capital Rationing, Additional Questions on investment appraisal, Replacement, lease or buy , and two videos on risk management and measurement. Cost Of Capital:– This section contains a 43-minutes video that exhaustively, explains the concepts of Cost of Capital,, several methods of calculating cost of capital of different components of the capital structure, including mention of The Capital Assets Pricing Model (CAPM). It also explains the concept of “Beta” and how to compute the project beta of a company. Valuation Of Shares And Efficient Market Hypothesis:– This section contains 2 videos; A video that illustrated was of valuing shares and other fixed income capital such as bond and Preference shares; another video that explains the concept of Efficient Market Hypothesis. Business Financing Options: – This section contains 2 videos that covers sources of short-tem, medium and long term financing, financing for SMEs, Islamic Financing, venture capital etc. Capital Structure And Financial Leverage (Gearing):- Here, you have 2 videos that covers capitals structure and Gearing, Traditional and Modigliani Theory of Capital Capital Structure, Arbitrage deals etc. Dividend Policy:- This section contains a single video that covers dividends policy and also include stock split, stock dividends, different theories of dividends. etc. Portfolio Theory:- This section covers a number of videos that covers risk and returns, CAPM, systematic and market risks, beta, etc. Bond Valuation:- This section gives you a further insight into the operation of bonds, how to calculate bond price using Net Present Value, and also understand the concept of duration of a bond. Corporate Restructuring:- This section contains a number of videos that deals on the subject matter of Mergers & Acquisitions, take-overs and strategies, financing Mergers, Management Buy-outs etc.